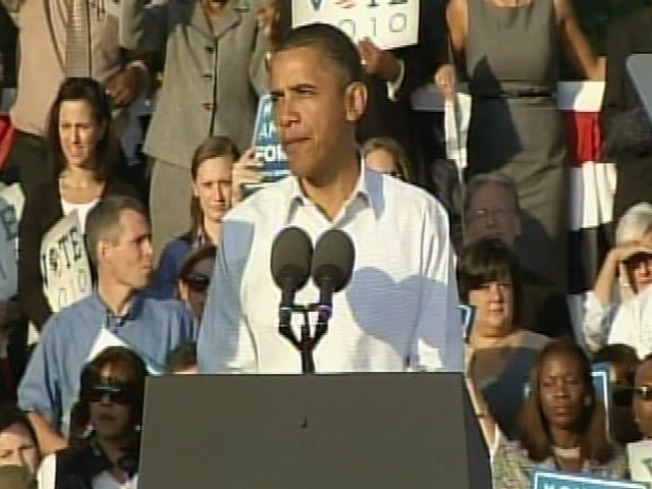 President Obama and Vice President Joe Biden fired up a crowd of thousands in Germantown on Sunday. Pollsters believe that the Republican voter base is more energized than Democratic voters. “We need Philadelphia to show up and send a message that we are not going back,” said Dan Onorato, the Democratic candidate for the Governor of Pennsylvania. “You don’t just vote once for change, you continue fighting for change,” said the Democatic Pennsylvania Senate candidate, Joe Sestak. Joe's Republican opponent, Pat Toomey, doubts that Democrats in Philly can make that change however. The crowd at the rally, which also featured a performance by Philly hip-hop group the Roots, was enthusiastic and energized. The main theme of the outing was the importance of gaining momentum in the party up until November, and then going out to the polls to vote. “Our job is not done,” said Obama. "On November 8th, I need you to be as fired up as you were in 2008."